Production Planning and Control draws on practitioner experiences on the shop floor, covering everything a manufacturing or industrial engineer needs to know on the topic. 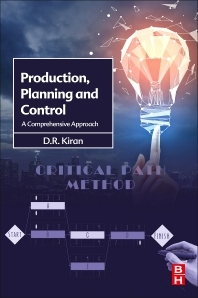 It provides basic knowledge on production functions that are essential for the effective use of PP&C techniques and tools. It is written in an approachable style, thus making it ideal for readers with limited knowledge of production planning. Comprehensive coverage includes quality management, lean management, factory planning, and how they relate to PP&C. End of chapter questions help readers ensure they have grasped the most important concepts. With its focus on actionable knowledge and broad coverage of essential reference material, this is the ideal PP&C resource to accompany work, research or study. D.R Kiran has forty years of experience in both industry and academia. He has held a range of management positions including Planning Manager of Rallifan (CF division), World Bank Adviser/Instructor for Transport Managers in Tanzania, and the Principal of PMR Institute of Technology, Chennai. In Universities he has taught subjects including Total Quality Management, Professional Ethics and Maintenance Engineering Management. He is the author of 2 books, and numerous journal articles, and was presented with the coveted Bharat Excellence Award and Gold Medal for Excellence in Education in New Delhi in 2006.